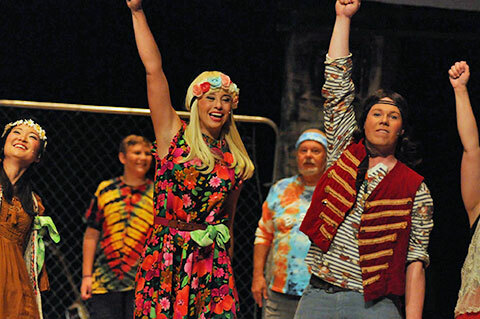 Godspell was the first major musical theatre offering from 3-time Grammy and Academy Award winner Stephen Schwartz (Wicked, Pippin, Children of Eden); and it took the world by storm. A small group of people help Jesus Christ tell different parables by using a wide variety of games, storytelling techniques, and hefty dose of comic timing. An eclectic blend of songs ranging in style from pop to vaudeville is employed as the story of Jesus’s life dances across the stage. Dissolving hauntingly into the Last Supper and the Crucifixion, Jesus’s messages of kindness, tolerance, and love come vibrantly to life.